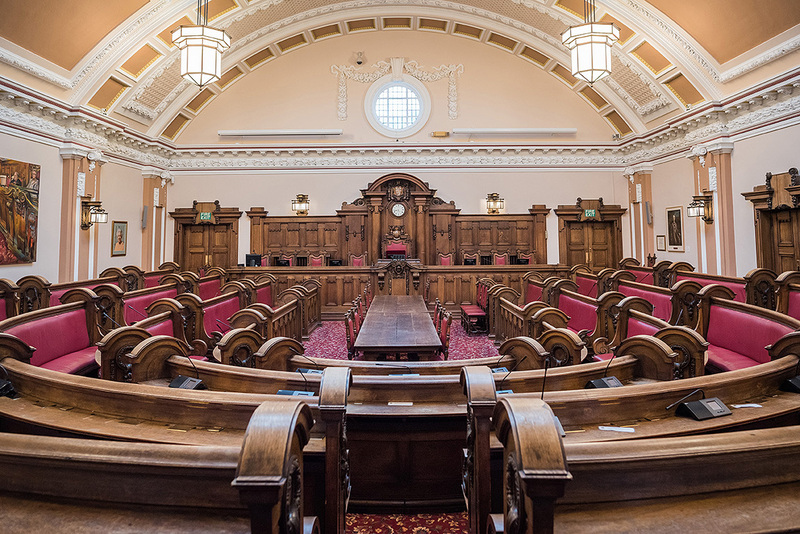 An enquiry from a firm of architects in Stoke-on-Trent inviting me to photograph the interior of a Grade II listed building, the Victorian Town Hall, whose refurbishment they’d supervised …… this was in the realm of ‘if Carlsberg did commercial photography enquiries’ …. One of the great joys and privileges of my job is going to places that ordinary people simply aren’t allowed to. The newly refurbished council chamber shown below is a case in point. I love Victorian architecture (come on, who doesn’t? ), and here is a prime example. Not only that, it’s just been spruced up to look as good as it did originally. And then I’m granted access, have the place to myself, and am left to photograph it. For me, it doesn’t really get better than that. When I’m photographing an interior like this I’m trying to achieve several things. Firstly, I’m trying to show the grandeur of the room. All that oak – panelling and benches; the sweep and scale of the room (it seats hundreds); the sumptuousness of the plasterwork around the walls and ceiling; and the symmetry of the design. Many of the compositions are designed to show off the symmetry and formality of the room in the choice of angle. I’ve also included some panoramic shots (you thought they just were for landscapes didn’t you? Go on, admit it!) that show the wide view that the camera simply can’t record in a single shot. As well as the Chamber, the surrounding corridors and public areas have also been updated and refurbished, and I’ve included a couple of shots of those too; not only to show off the work done by CTD Architects, but for completeness. In these shots, while I’m again looking to give the sense of scale and impressiveness of the decor, I’m also looking to highlight details (such as those beautiful restored wall tiles). The building contains more gems on the first floor (the entire building has been refurbished), but that’s for another post.